Part of thru-hiking the John Muir Trail is arranging resupply. It’s possible to hike the JMT fast enough to dispense with that chore (Andrew Skurka hiked the entire trail in seven days, last year), but few do so. The primary purpose of the resupply is to position the food you will eat during the next segment of your hike. What to eat, and to pack, is beyond the scope of this post. What I can offer is some tips in regards to how to pack, and what extras to include. 1. Probably the most important thing to remember is that there are prohibitions against mailing or shipping fuel. This includes self-contained fuel canisters. If you’re coming from the continental United States, Canada, or Mexico, and assuming you pack and mark your package correctly, you may be able to send certain items (like canisters) via GROUND transportation. Check with your local post office or shipping company. 2. 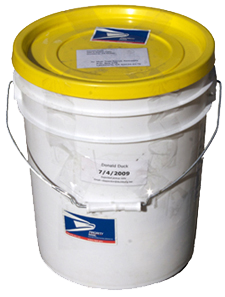 Consider using a paint bucket for your shipping container. (The five-gallon version is a good size.) True, it’s a little heavier than a cardboard box, but it is also far more secure. The thick plastic makes it impervious to mice and rats. If you pack in cardboard, they may smell your food and decide to do some snacking, either in-transit, or while it sits in a storeroom waiting for your arrival. If you are intending to resupply at Muir Trail Ranch (which is a likely spot, since it is almost exactly half-way), you are required to use a bucket. They have a terrific web page that describes exactly how to pack it, seal it and mark it, along with other great information. 3. Leave out the flask of whiskey. Alcohol is strictly forbidden in packages delivered by the post office, and UPS and FedEx make it so difficult that it isn’t worth the trouble. 4. Here are some items to include that you may not have considered: laundry detergent for the washing machine, a set of “disposable” clothes to wear so that you can wash everything, replacement batteries for electronics, hotel-sized bottles of shampoo and conditioner, a magazine or two to read while you’re relaxing (if you are taking some time at the resupply location), and copious amounts of your favorite junk food. 5. Finally, here is an idea for those of you with a family. Once you finish packing everything you want, if there is space still available at the top of the bucket, mention to your family that you won’t be mailing it until the next day. Suggest that they slip in whatever tickles their fancy. (Good ideas include notes of encouragement, greeting cards, tasty treats and photographs.) Once they’re done, seal and send–no peeking! One added idea. Include in your resupply bucket a flat-rate postal box to return to yourself anything you no longer want to carry or to swap out items (replacing underwear or socks is a treat). Or just a return label which you can put back on the bucket to return it home. (Different resupply places have different requirements and costs for return mail so check for each one – e.g., MTR will return flat-rate boxes but not the buckets). What does MTR do with all those buckets? Great question! I imagine they come in handy on a ranch!